1. Protein pizzas are a fraction of the calories of traditional pizzas which means you can eat pizza as often as you want and not have to worry about going way over your calories for the day! 2. They’re unbelievably quick and easy to make. Seriously, anyone can do this. And you need very few ingredients to make them, nothing crazy or super tricky involved. 3. By making a crust that’s high in protein, you can top your pizza with a ton of veggies and end up with a macro-balanced meal! One that features an equal amount of protein, fat, and carbs. What’s not to love? Yeah, hehe, no need to kneed or throw any dough into the air with this one. No need to risk your head being completely covered by dough or risk having to scrape your walls, furniture (or, Heavens forbid! ), your family after the dough catches on your ceiling fan. Nah. This dough is made in under 10 minutes and requires nothing other than a few basic ingredients and a nonstick cookie tray. Yes! A cookie tray. That’s all you need. I’m delighted to share this recipe with you not because it’s of one of my favorite protein pizzas to date but because this pizza right here will grace the cover of the second edition of my 2015 cookbook! It’s out in bookstores worldwide and you can buy it on amazon (US and UK) and Barnes & Noble! It’s also in Sam’s Club, Walmart, and several other big box stores globally, just in time to wrap in Christmas paper. Yeah, babies! 1. In a bowl, whisk everything together, adding the milk gradually until you end up with a thick pancakey dough. 2. Spread this dough on a nonstick cookie tray (ideally lined with baking/parchment nonstick paper). 3. Grill/broil for 6-8 minutes until the crust has cooked through. 4. Top with tomato sauce, veggie toppings, and a combination of sharp cheddar and gouda cheese. Obviously this is all up to you though – the type of sauce you use, the type of toppings, and the type of cheese. Anything goes. You can even use ketchup for your sauce. I know, I know, not very ‘couth’ but you don’t need much and it works if you’re in hurry and out of tomato paste or a proper tomato sauce. 5. Grill/broil for a further 10-12 minutes or until the cheese has melted nicely and the edges of your dough have browned a bit. 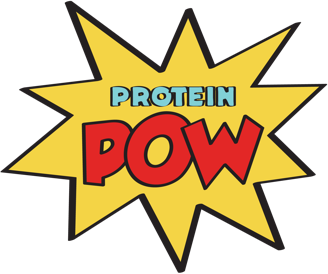 Please don’t sub the pea protein for whey. This recipe needs pea protein to work! Or a blend, like the one I used on my pizza here.